Middle school science teachers have a new tool from the University of Florida to teach students about pollinators and the role they play in producing food. The curriculum contains three lesson plans and a variety of activities to introduce students to pollinators in fun, interactive ways. “The thinking behind the activities is to engage students in several ways: inside the classroom through computer-based, online learning; outside the classroom in natural areas; and through relevant, real​-world inquiry,” Pinson explained. The curriculum includes a Pollinator Power Safari Kit, which contains bug jars, a butterfly net, magnifier, and insect and flower rubbing plates. With these supplies, students can scout a garden or landscape for pollinator insects and animals. In another activity, students get to “Be the Bee” by hand-pollinating squash or zucchini flowers. For teachers, the curriculum is a one-stop shop for teaching pollinator science, Pinson said. While the lessons were designed to mirror topics taught in grades five through eight, teachers can adapt them for learners of other ages and even adults, Lamborn said. With reports of declining pollinator populations, this curriculum is highly relevant to students today who want to know how to support pollinators, she added. For educators with students who are afraid of bees and wasps, the curriculum can help those students better appreciate these insects and to see them as beneficial, Lamborn said.. In Pinson’s experience, however, most youth enjoy learning about pollinator insects and animals, especially when they are able to identify them in the garden or schoolyard. 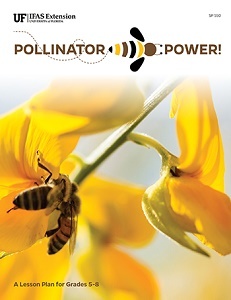 To order the Pollinator Power curriculum, visit the UF/IFAS Extension bookstore website (ifasbooks.com).